There are 24 categories in all. Librarians are on hand to make recommendations. Thanks to them, I’ve added V is for Vendetta and Eleanor and Park to my reading list! Because of my already ambitious reading plans for the summer, including Women in Translation Month, I’m not aiming for a blackout, just BINGO. But it occurred to me. Book Bingo is endlessly adaptable. What about Women in Translation Bingo? Each category satisfied by a book in translation, by a woman. I made my own card, based on SPL & SAL’s card, simply swapping out Set in the NW, Translated from another language, and local author for Author 10+ years older than you, From a culture you want to know more about, and International bestseller. Then I really nerded out, thinking about Linguistic Diversity Bingo, based on language families. But, I’m getting ahead of myself. 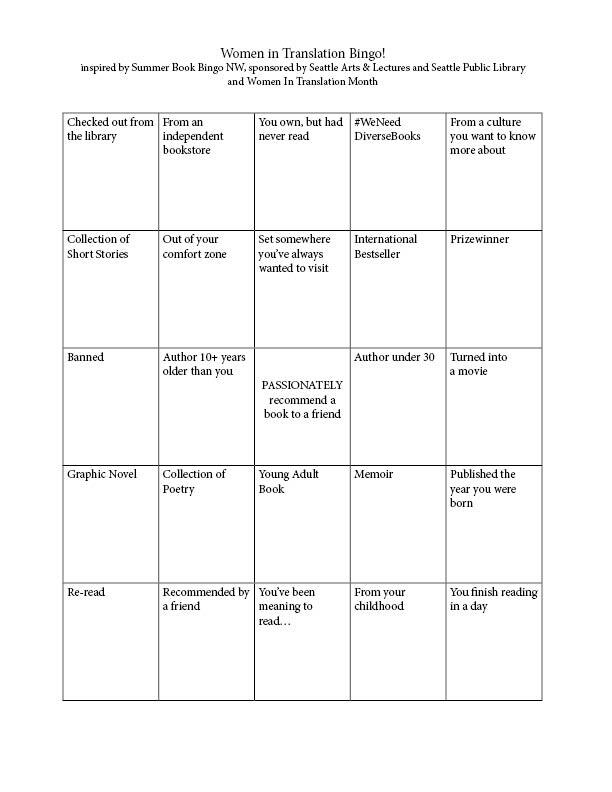 One Book Bingo at a time. If you’re planning to participate in Women in Translation Month (I hope you are!) this would be a fun way to do it. What books are you reading this summer?